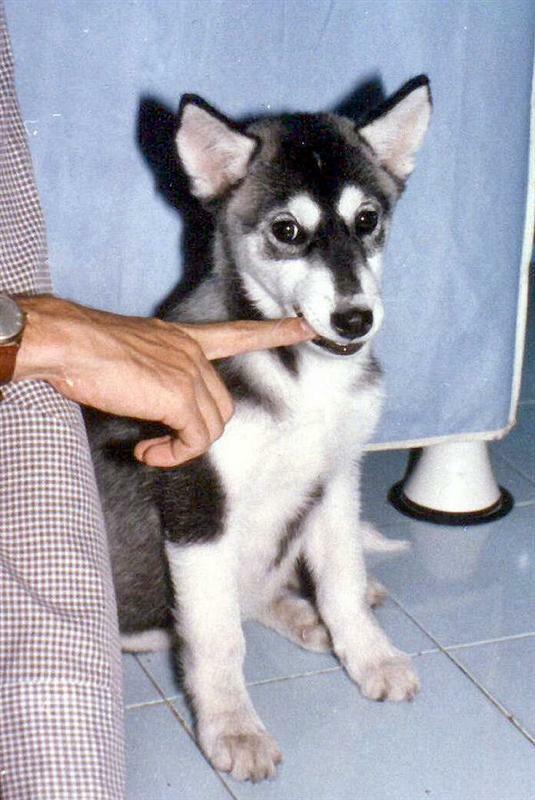 Cookie was my little Siberian Husky, back in 1991. She stayed with us for 10 years. I miss her a lot and still today, dream about her - all the time. She is somehow always in my dreams. I am not sure I want another dog these days, because you just get atoo attached to them and, when they are gone, it looks like the world is no longer the same. She never ceased to amaze me. It seems to me that these huskies are quite an independent breed. She was not the type of letting herself sit on your lap and stay quiet. No. She was sweet, but never liked to have her movements restrained by hugs and excessive "dog-love". But she liked to lay down on my bed and rest her head on my pillow. Of course, when my Mother was not at home. The moment Mum arrived and turned the keys on the door, she would jump and lay on the floor - as if nothing had happened. 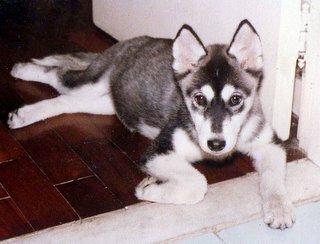 I miss these little "dog things" a lot, to be frank! I now think she saw me as a "sister" and not her master. If anyone was the Master in the house for her, that was my Mum. Not me! She treated me like an equal almost. The above picture I took after she attacked the banana cake that was on the kitchen table, cooling after baking. We could never imagine she would be able to get it, of course. She was so tiny. But she used the chair (for the 1st time; this was before the ham episode) and reached the cake. She ate it all. Her belly was huge and she could hardly move, with those short and fluffy legs. She's got a bit of a "guilty" air in the picture of course. She could not run away (as she usually did) when we tried to educate her about stealing food! There she stood, with a cute, guilty expression and those eyes (that actually had lashes, thick black lashes, believe it or not!). I could not resist and decided to immortalise that moment! That's it for today. Just missing her... Tomorrow I will be going to the doctor to, among other things, show him my tummy that did not heal from the burning. Then I will have a coffee at Kelly's and head to the office. My plans for tonight are to have some vegetarian lasagna and watch the 2nd chapter of "Desperate Housewives" (2nd Season). I just love that sitcom. Those actors are amazing and the situations quite quirky, bordering the surreal... Cannot wait!